November issue of Digger is out! You are here: Home / November issue of Digger is out! 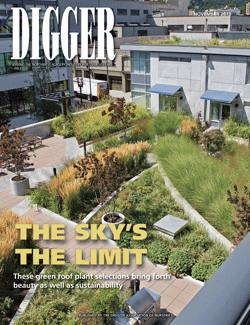 Green roofs are the cover story (PDF) in the November issue of Digger magazine. In it, we observe that the market for green roof plants isn’t limited to succulents and drought-tolerant species. “Intensive” rooftop gardens are considered people places and can include a variety of plants and trees. The issue also includes a story on winter plant protection (PDF) and an OSU: Growing Knowledge story on managing costs to better ensure profitability (PDF). What’s more, the newly-crowned OAN Young Nursery Professional of the Year, Josh Zielinski, is featured in this month’s installment of Meet the Leader (PDF). Digger is read not just by OAN members, but by more than 8,500 nursery professionals each and every month. Gain new customers and grow your business by advertising in the display or classified sections. Contact Chris Sweet today at 503-582-2012 or csweet@oan.org. Send your comments on the magazine to editor Elizabeth Peters (epeters@oan.org) or managing editor Curt Kipp (ckipp@oan.org).